Two men from disparate worlds search for what constitutes a meaningful life in a searing portrait of honor and masculinity, sport and celebrity, marriage and parenthood in this “rough, tough, and thoughtful” (Phil Mushnick, New York Post) debut from Pulitzer Prize finalist and front-page columnist Mark Di Ionno. Joe Grudeck is a living legend—a first-ballot Hall of Famer beloved by Boston Red Sox fans who once played for millions under the bright Fenway lights. Now, he finds himself haunted by his own history, searching for connection in a world that’s alienated his true self beneath his celebrity persona. Soon, he’ll step back into the spotlight once more with a very risky Cooperstown acceptance speech that has the power to change everything—except the darkness in his past. Horace Mueller is a different type altogether—working in darkness at a museum blacksmith shop and living in a rundown farmhouse on the outskirts of Cooperstown, New York. He clings to an antiquated lifestyle, fueled by nostalgia for simpler times and a rebellion against the sport-celebrity lifestyle of Cooperstown. His baseball prodigy son, however, veers towards everything Horace has spent his life railing against. Gods of Wood and Stone is the story of these two men—a timeless, but strikingly singular tale of the responsibilities of manhood and the pitfalls of glory in a painful and exhilarating novel that’s distinctly American. “Delivered with a fan’s passion, a journalist’s eye for detail, and the unblinking courage of a storyteller, Mark Di Ionno knocks it out of the park with this piercing literary thriller” (Bryan Gruley, award-winning author of the Starvation Lake trilogy). This reading group guide for Gods of Wood and Stone includes an introduction, discussion questions, ideas for enhancing your book club, and a Q&A with author Mark Di Ionno. The suggested questions are intended to help your reading group find new and interesting angles and topics for your discussion. We hope that these ideas will enrich your conversation and increase your enjoyment of the book. Joe Grudeck is a living legend—a first-ballot Hall of Famer beloved by Boston Red Sox fans—who once played for millions under the bright Fenway lights. Now, he finds himself haunted by his own history, searching for connection in a world that’s alienated the true person behind his celebrity facade. He’ll step back into the spotlight once more with a very risky Hall of Fame acceptance speech that has the power to change everything—except the darkness in his past. Horace Mueller is a different type altogether—working in darkness at a museum blacksmith shop and living in a rundown farmhouse on the outskirts of Cooperstown, New York. He clings to an anachronistic lifestyle, fueled by nostalgia for simpler times and a rebellion against the sports-celebrity lifestyle of Cooperstown, struggling to bring his baseball prodigy son to his side. 1. In this author’s acknowledgments, he writes that there had been many titles thrown around and decrees the final title, Gods of Wood and Stone, to be “perfect.” Do you think the title fits the work? Are there other titles you believe may have suited it? 2. Consider reading some of Mark Di Ionno’s newspaper articles from his career, particularly his sports stories from his early career in the New York Post. Do you see any similarities in his writing style? How do you think his journalism background informed his writing of this novel? 3. Baseball has long been considered America’s Pastime, from live broadcasts on the radio to the highly publicized televised events today. Discuss the role of the audience, fans, bystanders, and/or patrons in this novel, both at the farm museum and at baseball-related events. 4. Take a moment to consider the impact of one’s career or profession in your or a friend’s life. Can you relate to Joe Grudeck’s reaction to his history? What about Stacy’s reaction to Joe upon his return? Or do you find more to relate to in Horace, as he identifies deeply with his work in a way that Sally seems to think has caused him to adapt to it? 5. The idea of home is a recurrent theme throughout the novel. For Joe, home is not one he created himself. For Horace, it’s the opposite. How would both characters define the word home for themselves and their families? 6. In many ways, this book can be regarded as two portrayals of the American Dream: Joe becomes a very famous individual by significant effort, while Horace finds fierce pride in his family’s immigrant roots. As a group, outline the differences between these two versions of the American Dream. Which do you think you would rather have for a loved one or yourself? 7. “We have raised a generation that believes athletes are heroes and sports results are history.” (page 181) Consider this scene and conversation in the context of how we view athletes or celebrities in America today. Do you agree Horace’s comments on this behavior? Do you think Americans are losing sight of what its history comes from and what determines it? 8. “The Cardiff Giant” section of the book takes the reader out of the twenty-first century and transports them to another time. The Cardiff Giant’s role in the entertainment industry—and the history of New York State—may be viewed as a major turning point for men like P. T. Barnum and others. Discuss how you think this section and the Cardiff Giant itself may serve as a metaphor for Joe Grudeck’s or Horace’s life in the book. Do you think the historical anecdote helps you to better understand either character’s personality or struggle? Why or why not? 9. “Look around you, son,” Horace would say. “Cooperstown may not be the birthplace of baseball, but it is the birthplace of something bigger. It is the birthplace of American Manhood.” (page 45) Discuss the themes of masculinity that weave throughout the novel. 10. Expanding on themes of masculinity, compare and contrast the various relationships between fathers and sons in the novel. Discuss the change in Horace’s relationship with Michael that develops toward the book’s end. 11. The question of authenticity frequently arises in the novel. Discuss what authenticity means to Horace versus Joe. In what ways would you characterize these men as “authentic”? Do you think their definitions of authenticity are similar or different? 12. “Americans hate hypocrites as much as they love athletes. And trust me, once one of the media jackals rips into you, the pack will follow and tear you apart.” (page 291) Discuss Sal’s comment in connection with contemporary scandals in American media. Can Joe be viewed as a hypocrite in his behavior? Why or why not? 13. Do the final actions of the novel come as a surprise to you? Why do you think Horace attacks Joe? 14. The central figures in the novel are men, and the women in their lives are often cast aside, ignored, or physically abused. Discuss their relationships with these women. What gender dynamics exist? Are the relationships between mothers and sons surprising to you given the behavior of the adult men? Why or why not? 1. Take a trip to the local baseball team stadium (minor leagues can also be super fun!) or the Hall of Fame in Cooperstown, NY, and discuss how the scenes in the stands came to life. 2. Consider reading The Natural by Bernard Malamud or Billy Lynn’s Long Halftime Walk by Ben Fountain as your next book club pick. Discuss how the works relate to each other. Is there one your group likes best? 3. As a group, research the Cardiff Giant, other related hoaxes, P. T. Barnum, and the birth of the entertainment industry that began around 1869. Discuss in which ways these forms of entertainment continue to thrive in contemporary America. Do you see any foreshadowing of modern leisure activities? Is the entertainment largely escapist or educational? You come from an extensive background in journalism. Did your career in nonfiction come in handy while researching this book? Yes, of course. Not only in journalism but my experiences as a sportswriter, editor, and general news columnist also did. As a sportswriter and sports columnist at the New York Post, I interviewed many household-name athletes and witnessed their behavior and attitudes toward fans, particularly women. The part of about Joe Grudeck’s memorabilia cash-and-carry exploits came directly from an investigation I did into Pete Rose’s memorabilia business before he was banned from baseball. Both Joe Grudeck and Horace Mueller are composites of people I have covered. Many sections, especially those about the Giant, contain extraordinary historical context and detail. Did you uncover anything in your research worth sharing, other than what was included in the book? Were there any articles, books, or sources that you’d recommend your readers continue reading for additional information on the historical shift of entertainment (and baseball) in 1869? I became interested in the Cardiff Giant during a visit to the Farmers Museum in Cooperstown, NY, in the 1990s. There was an academic dissertation I found on line that was very informed about the Giant as a sensation. But much of the idea of the “historical shift in entertainment” came from my own knowledge of the heightening of industry, the lingering horrors of the Civil War, and the advent of manufactured goods, which at once created a need for advertising and allowed people more leisure time. What came first for you in writing this book: the characters or the plot? Did you imagine having two plots simultaneously woven before they finally intersected? Did you plan to write a novel about a baseball player first or did that occur as your research brought you there? The characters came first. Both were manifestations of my belief that our popular and sports culture has run rampant over more “authentic” traditions and cultures. As the characters formed in my head, I knew their intersection had to be public and violent, and the media would play a large part. I struggled with the idea that the athlete should be a football player because, in my mind, the NFL is much more egregious and predatory in building football as a sport that overshadows all else. There are many more negative consequences of playing football in terms of lifelong physical and mental injury, fan violence, and over-commercialism. But I couldn’t escape the Cooperstown connection. More history resides there, as well as the striking discord between the interest in the Farmers Museum and The Hall. It was perfect fuel for Horace’s bitterness. Are the characters inspired by people you’ve known or perhaps written about over the years? Yes. Absolutely. When I became a sportswriter, the last of the Joe Grudeck types were moving out. Gritty, one-team, loyal players. And as I stated before, I came to know many passionate—and broke—history reenactors and curators. Writing an article (even one close to 3,000 words) is a much different experience from writing a novel. Can you discuss how your writing process differed in putting together Gods of Wood and Stone versus the countless articles you have done over the years? In some ways they are similar. I write one scene at a time, then polish. The big difference of course is that columns give you a boost of adrenaline and the gratification of seeing your work published immediately. Deadline looms; when it’s done, it’s done. A novel requires a much different stick-to-it-iveness. It’s long and drawn out. It becomes laborious and not much fun at times. Deciding a work’s title can be quite a challenge for an editor and an author. In the acknowledgments, you mention that there had been many titles thrown around and decrees this title to be “perfect.” Are there other titles you believe may have suited it? How did you eventually come to this one? My original title was American Mythology, which was roundly booed by everyone. Gods of Wood and Stone was the idea of David Falk, the brilliant editor of the book, and which he found in a biblical passage about a “false idol”. What are some of your favorite books to read? Is there one book you could re-read time and time again or another you recommend to anyone in need of a good book? I loved Mr. Vertigo by Paul Auster, which is one of his lesser known books. Billy Lynn’s Long Halftime Walk by Ben Fountain was a book I wish I had written because he captured the very same themes brilliantly. As a veteran, it truly appealed to my sense that we have the word “hero” ill-defined in our country. My favorite short story of all time is Keeper of the Faith by Philip Roth. Of course, The Natural is the best baseball book ever written. Bernard Malamud remains my writing idol for his simplicity and depth. And John Steinbeck for his journalistic themes. Are you currently working on another book? If so, will it be another novel or perhaps a work of nonfiction? Yes. It’s about police PTSD and stems from my journalistic work covering urban violence. It is dark, but truthful. Which team are you rooting for in the next (either this year or years to come) World Series? I don’t watch much baseball, or any sports for that matter. I’d much rather go to a local high school game than to a professional event. 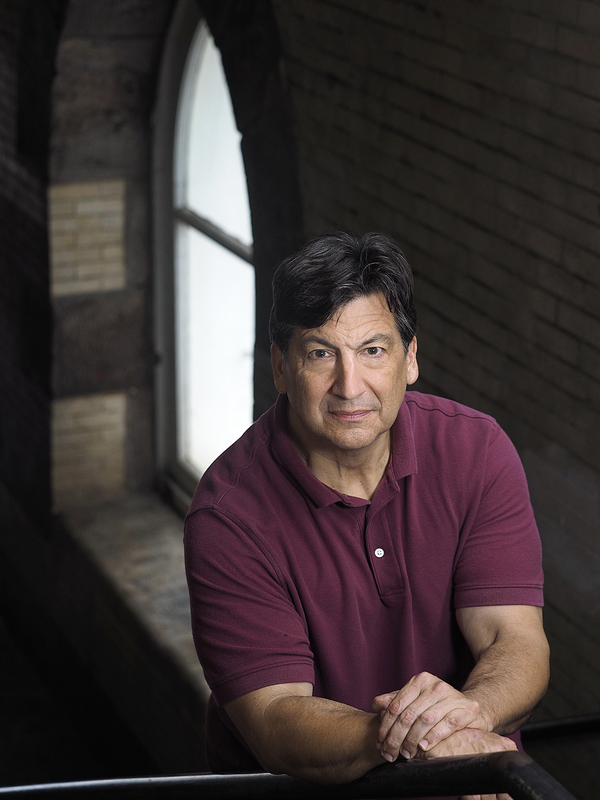 Mark Di Ionno is a lifelong journalist and Pulitzer Prize finalist. He is a front-page columnist for The Star-Ledger, and its online partner nj.com. He began his career as a sportswriter for the New York Post. He is an adjunct professor of journalism at Rutgers University and a single father of six children. He lives in New Jersey. 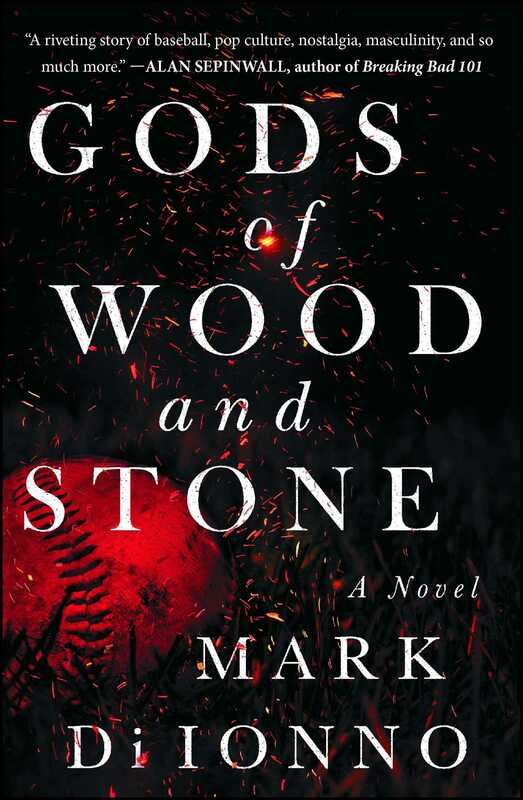 A riveting story of baseball, pop culture, nostalgia, masculinity, and so much more, Mark Di Ionno's Gods of Wood and Stone is pure heat from a veteran at the top of his game. As a sportswriter, sports columnist, at-large columnist and now an accomplished author, Mark Di Ionno has succeeded because he shares his sharp and unafraid probings of life and lives beneath their exteriors. Gods of Wood and Stone is rough, tough and thoughtful, blending his considerable abilities. Gods of Wood and Stone isn’t a baseball novel; it’s a story of what really afflicts American men: disappointment. Mark Di Ionno is a gifted writer and renders his characters in ways both ruthless and empathetic. You won’t forget Joe Grudeck. Or Horace Mueller. They live. They stay with you. They want you to know: what we learn of our heroes hurts less than what they learn of themselves. Engrossing from the first page, this clear-eyed and atmospheric novel hurtled me through a roller coaster of emotions—from curiosity to outrage to relief. How are American men raised to think about fame, talent, hard work, and women? What happens when two men with opposing worldviews get in each other’s way? Gods of Wood and Stone raises important questions of our time. Framed against a backdrop of baseball and a life of land and country, this is a novel of nostalgia vs. progress, of grind vs. instant gratification, of lasting glory vs. Twitter celebrity. Delivered with a fan’s passion, a journalist’s eye for detail, and the unblinking courage of a storyteller, Mark Di Ionno knocks it out of the park with this piercing literary thriller, Gods of Wood and Stone.